Are you a quilter who has a list of “I’m going to make this eventually” quilts? I’m not exactly talking about a to-do list, more of a bucket list of quilts you dream of making one day. I believe that every quilter has at least one quilt they want to accomplish. My quilting bucket list seems to get longer by the hour. It contains a variety of themes, styles and challenges. Here are a few that come to mind for me. The Gnome Angel blog does a great block-by-block tutorial for this quilt. If I ever get around to starting, they will be my go-to resource. Laurie Aaron Hird has literally written the book on this quilt, using letter written to The Farmer’s Wife magazine as inspiration to design the blocks. I haven’t purchased the book yet, but it is absolutely on my wish list. I love that this quilt was designed scrappy. And the on-point setting really sets this apart from most samplers. As some of you already know, I have started my Dear Jane quilt. This one is based on a quilt made by Jane Stickle in the 1800’s. This quilt is a serious undertaking. It has 169 center blocks (4.5″ finished), a pieced triangle border and scalloped edges. Brenda Papadakis has put out a book on this quilt, which includes great information about Jane Stickle and her life. It also has scale diagrams of each block. I have access to this book, but I tend to reference Susan Gatewoods website instead. Susan has provided instructions on how to piece each individual block, and has included templates with each block to use as needed. Her instructions are 100% free to access, print and use. I am machine piecing my Dear Jane. I can’t even fathom the work that must have gone into the original. Since I started quilting, I’ve been fascinated by the movement and illusion of Bargello Quilts, like this Diamond Jubilee Bargello from Family Farm Handcrafts. I love that this one uses varying shades of blues/neutrals. I also like the symmetrical design. POTC is a pattern I believe by Lucy Boston. This particular photo came from the Little Quilts blog, taken at the Huston Quilt Show. 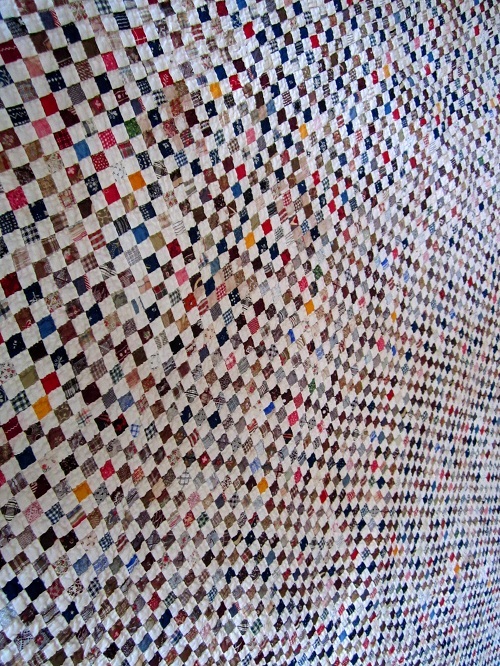 This quilt is traditionally made using English paper piecing. Once my hexie quilt is finished, this will take over as my hand pieced project. I’d also like to make a Postage Stamp quilt. I want to use 1 1/2″ squares to piece it. I love this light/dark/light/dark by Ivory Springs, but I’ve also considered using the neutrals to create a design throughout the pattern. This might be my next leader/ender project, after the tumblers. These are just a few of my Bucket List quilts. What quilts are on your list? Have you started any of them? Have you finished any of them? I started the Farmer’s Wife… three years ago, maybe? I have about 80+ of the blocks finished and it so officially a UFO now. Yes, I will finish it, I even have a place to hang it but…. we all know how easily we get distracted. I do not have any other specific “must do before passing” quilts. :~) I trust I have plenty of time to finish many, many, many more. The Farmers Wife is gorgeous, I can’t wait to see how yours turns out!